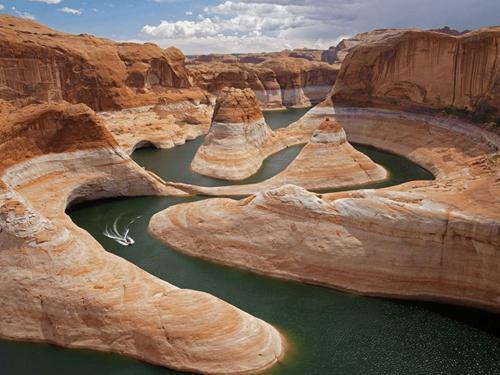 The Grand Canyon is a 446 kilometres long canyon, carved out by the Colorado River. At the widest it is up to 29 kilometres across. It has steep walls, and at some points it is more then 1800 metres deep. Almost 2 billion years of the earths geological history is exposed in the side of the walls. Most of the canyon is inside the Grand Canyon National Park. As a tourist site the park attracts several millions of tourists annually. Hiking, running, rafting and helicopter tours are offered along the canyon. There are also several historical buildings along the South Rim worth visiting. London Bridge was first constructed across the River Thames in London in 1831. It was dismantled and sold in 1967, because it couldn't handle the increasing traffic. 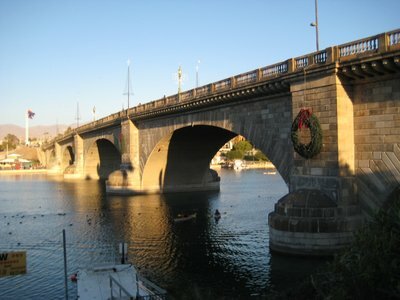 The Purchaser, Robert P. McCulloch, had the pieces of the bridge marked, moved it to Arizona, and reconstructed in Lake Havasu City. Now the bridge stands reinforced, and is connecting an island to the main land city. The bridge has five spans. The longest is 45,6 metres. The entire length of the bridge is 280 metres.